It all started with a sneeze. Then I was quickly completely congested. This all happened during the short flight to Chicago on Friday. “It’s just the plane’s recycled air,” I told myself. I often get sniffly on planes or whenever there’s excessive air conditioning. I brushed it off, even though I continued to sniffle once I got of the plane and through the evening. I refused to acknowledge or even mention to anyone I was getting a cold. If I didn’t acknowledge it, it’d just not become a full-on cold, right? Is that not how it works? Saturday morning, bright and early, I met with the Nike team (Nike Canada hosted me to run the marathon), and I knew this was most certainly a cold, and I admitted to Melissa from Best Health (for which I most recently wrote about healthy things to do in Portland) that I was coming down with something. I took it extra easy during the 5k shakeout run. And since this cold was now a real thing that I could no longer pretend was not happening, I posted it on my IG Stories, and I got a few recos (thank you!) and got some zinc lozenges and cough drops. I was so disappointed. 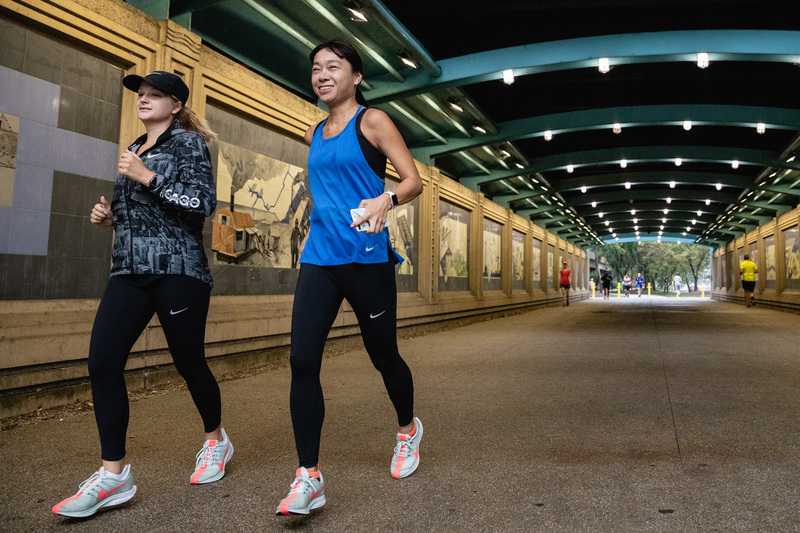 Here I was on an incredible Chicago Marathon weekend with Nike and I felt like crap on the inside. I didn’t let it damper my spirits for the race and activities, though. I customized Nike slides to wear post-race, and decorated a Just Do It tote bag. I got a motto drawn onto my arm: I am stronger than I think. Even better were the panels I got to attend with Nike, including hearing Elyse Kopecki (co-author of Run Fast, Eat Slow and its sequel Run Fast, Cook Fast, Eat Slow, which I got signed — can’t wait to cook from it! ), and Joan Benoit Samuelson, Amy Cragg and Jordan Hasey. So inspiring to hear these women at the top of their field share a bit about their journey and they were so encouraging, too. Plus, I got to ask Elyse about carb loading, more on that in another post. Chicago is a city I love, and I’d planned on maybe going to one museum Saturday afternoon, but with how awful I felt I just went to my room at the Chicago Athletic Association after the brunch and panel with Nike and relaxed for several hours. Around 6 p.m. I knew I needed to fuel, so I grabbed some roasted eggplant rigatoni at the Little Beet Table. Which I hear was delicious, however I couldn’t taste a thing since I was completely congested. Sunday morning, I got up at 5 a.m. and forced myself to eat a bagel with peanut butter (I always have a hard time eating a breakfast before a morning run). And, as though my body knew it needed to perform for me that day, I was thankfully not congested. I did have a very disheartening thought, though, as I got dressed that morning. All along, I’ve been saying I don’t know if I’ll PB but I know I’ll finish the race. I’ve never suffered anything during a race that I’ve felt I couldn’t continue the race so I felt confident I’d cross that finish line. But at dawn on Sunday, I realized I’ve never run a marathon with a cold. And that it was possible I’d just be too exhausted or even just too lightheaded (I am prone to fainting) to finish, and that freaked me out. “Nope, you’ve got this. You may have to go slower, but you can finish this race,” I told myself. With Nike, we walked across the street and made our way to the Balbo Hospitality Tent. Bag check, portapotty visit and then since I’d been assigned corral D (which sent me into a panicked tizzy on Saturday night, once I saw what the expected finish time was for corral D), headed out to get into the wave 1 start. I ended up deciding to start at the back of corral D since that’s a faster corral than what I can run. My goal for the race initially was to try to BQ. Then the BQ standards changed and got tougher. So I decided to try to PB. My marathon PB is 3:46, just under 3:47. So I had planned to run with the 3:45 Nike pacers. But those pacers were in a corral behind mine. So I decided I’ll just try to run even splits for a 3:45 finish; this is often my plan, however, I always go a little faster in the first half or so since I’m feeling good. But this time I told myself to rein it in. So I did, I naturally ran a little too fast for maybe the first 8k or so but I kept telling myself to dial it back to the pace I needed to finish 3:45. And it worked, mostly. I felt like I was running pretty comfortably, and i was somewhat tired thanks to the cold but I was thanking my lucky stars that I was not completely congested. I was so focused on how I was feeling and my pace that I actually forgot about the weather conditions. It drizzled a bit and then became heavier on and off throughout the whole race. But I was just so happy that the actual temperature was relatively cool that I didn’t even notice when it’d stop or start raining. Keep in mind that I think my brain was a bit foggy thanks to battling a cold. Chicago is a pretty phenomenal race thanks to how well it’s organized and the crowd support. While I love the flat route, I will admit I don’t find the views for most of the race that stunning (especially considering how beautiful the city is! ), but the so-so views are made up for with the incredible crowd support. This year, I don’t know if I’m imagining this, I think there were fewer people out cheering than in 2014 and 2017. I’m going to guess it was the wet weather. This just made me super appreciative of the people out there in the rain with their signs and claps and happy faces. I always try to smile and if I can muster out a thank you because having people there cheering provides such a huge boost. “Pain is temporary. Instagram is forever. Do it for the ‘gram!” read one sign that made me giggle. 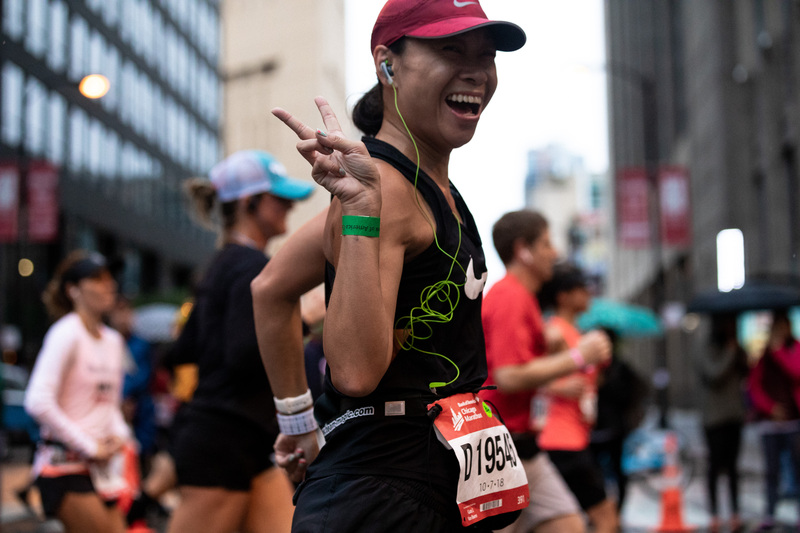 Sometime into the second half of the race, a girl running the race tapped me on the shoulder when I slowed to grab a Gatorade and said “Good job!” And it lifted my spirits. I tried to return the cheer when I came across her at the next water station, but she was distracted getting her own water. But she ran up to me later and started chatting a bit. I think she said her name was Natalie (I think…I have the worst memory! ), lives in L.A. but is from Chicago. Thank you, girl, our brief exchange lifted me out of the repetitiveness of the tough task at hand for just a moment! I had hoped we could run the rest of the race nearby one another but at this point (probably around the 25k to 30k mark) I was tiring and slowing down and I watched her disappear into the runners ahead of me. At the halfway point, I was about 2 minutes behind a 3:45 finish, and I was fine with that. After 25k is when it all went downhill. 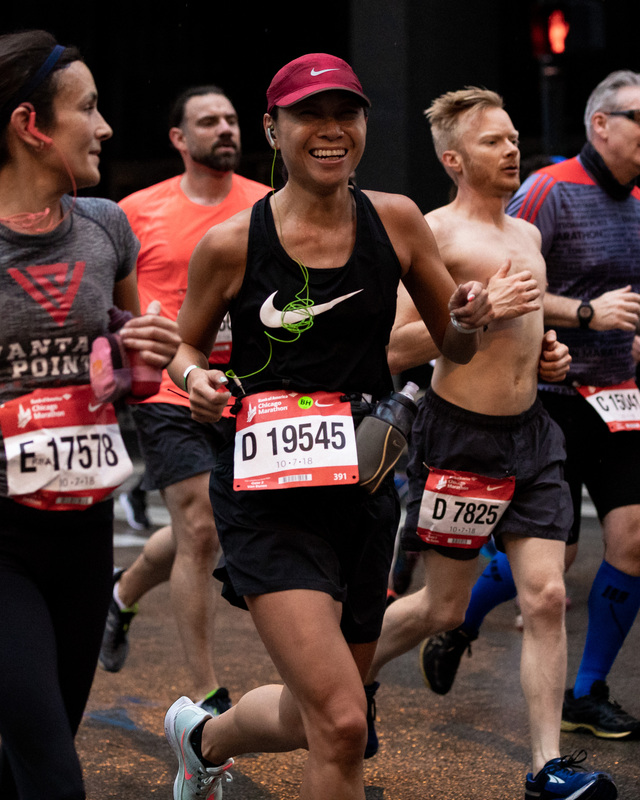 I was feeling increasingly tired and then realized how far I’d fallen behind that target, at which point, I knew I couldn’t PB and so I just viewed the rest of the race as a long run in one of my favourite cities and did my best to enjoy everything going on around me. When I was starting to feel down in the dumps, I thought how I’m running a goddamn marathon, and not everyone can do that. I looked at my great marathon manicure. 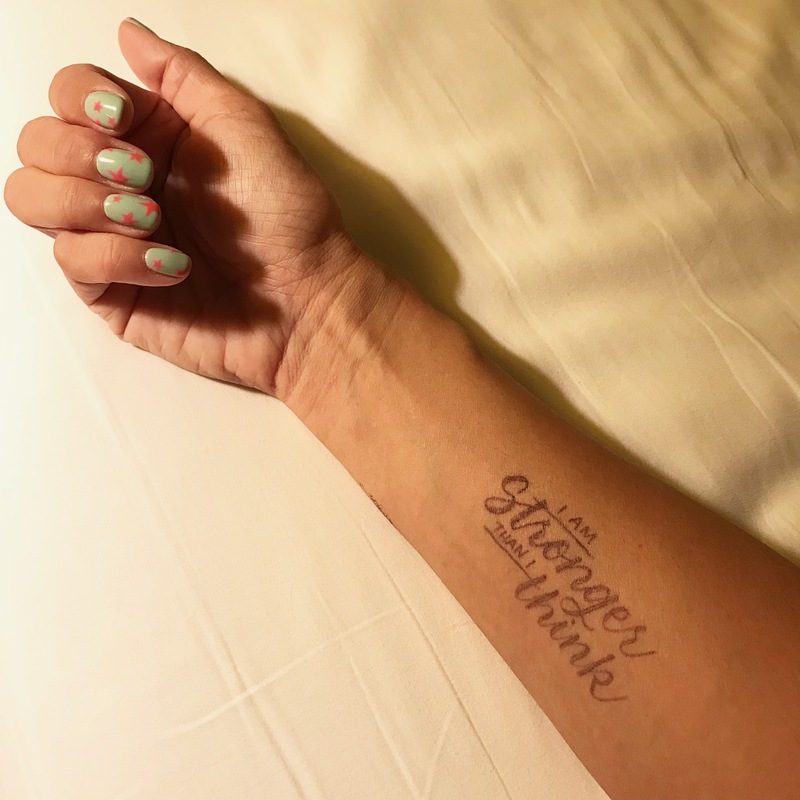 I said aloud, “I am stronger than I think,” as I glanced at the motto on my arm. 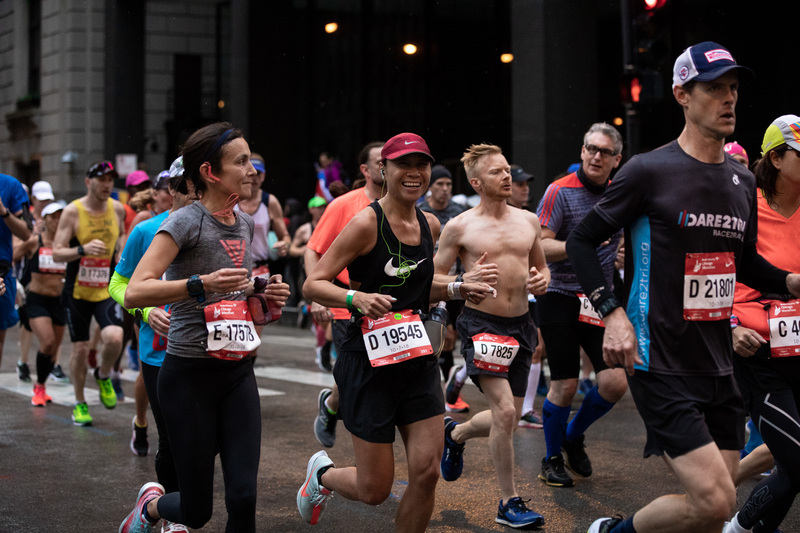 And I told myself that I may not be PBing but I’m doing this race with a cold and I’m in a freakin’ Nike Chicago Just Do It ad on Michigan Avenue and that this is my 12th marathon. 12! that’s more than I ever dreamed of ever doing when it comes to running. I never even thought I’d be a runner! And that’s a big accomplishment and just enjoy the damn thing, Karen! I finished in 4:10:27. I don’t know all of my marathon times offhand but I’m going to guess that that is my second slowest marathon of the 12th I’ve now completed. That’s 17,233 out of 45,000 or so runners, 5, 514th of the women who raced, and 919th in my age group. I was incredibly tight right after crossing the finish line and it took forever for me to get to the hospitality tent. I was walking so gingerly that twice volunteers went to help me as I struggled to lift my leg to get on a sidewalk (yes, a sidewalk, I struggled lifting my leg those mere six inches!). Changing out of my rain-soaked clothes was pretty funny (getting on a pair of leggings immediately after a marathon is quite a task!). I got a small bite to eat, drank my Goose Island Brewery beer and was delighted when Sir Mo came to share a few words at our tent. After he spoke, I gathered my things and made my way to my Nike billboard to get a post-race photo. I asked a family cheering at the race if they’d take my pic with the ad. They did and offered to take more when they saw me studying the pic. I accepted since my eyes were closed in the first photo. “That’s me!” I shared. They were so surprised and happy for me, that they gave me extra congrats, and even took a pic of me with their own camera. From there, I slowly walked back to the Chicago Athletic Association to shower before going to Au Cheval for a burger, and in my room was an incredible gift from Nike: Nike React Element 87s, an Apple Watch and the best part, a personalized bottle of Veuve Cliquot, congratulating me on the marathon, with a spot to jot in my marathon time. I’m copying fellow marathoner that day Brooke from Shape magazine and only opening it when I BQ. Champagne only lasts about 3-5 years so I’ve got a deadline to qualify! Can’t let that champagne go to waste! After Au Cheval, I met with the Nike crew for rooftop drinks and bites at Cindy’s at the hotel, and then we headed out to the 3RUN2 post-marathon dance party, where I found the energy to dance the night away. So what if I had a flight in the morning, it was time to celebrate! Thank you to Nike for an unforgettable weekend. Thank you to Nike Run Coach Brittany Moran for the training program and for answering all my questions over these last three months. Thank you to everyone who’s shared congrats and cheers along the way. 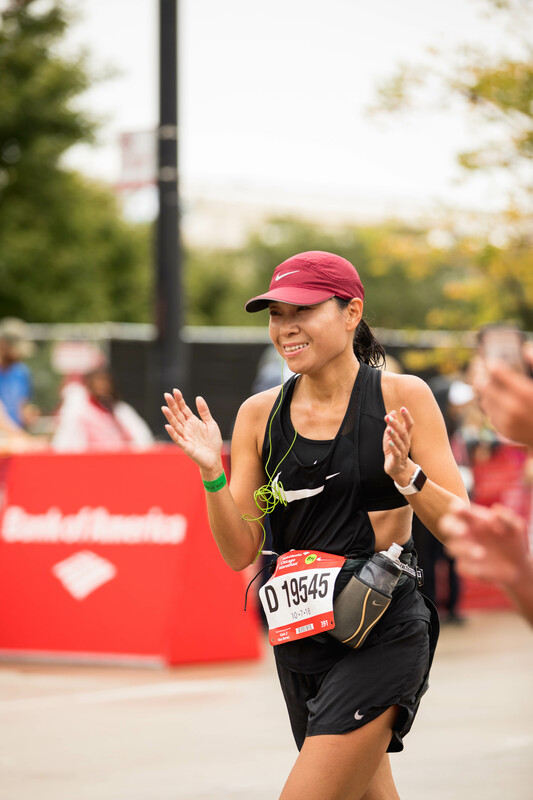 Running has long had its ups and downs for me, and this summer had me seriously questioning whether marathoning is something I should continue, particularly during those summer training days I was drenched in sweat. 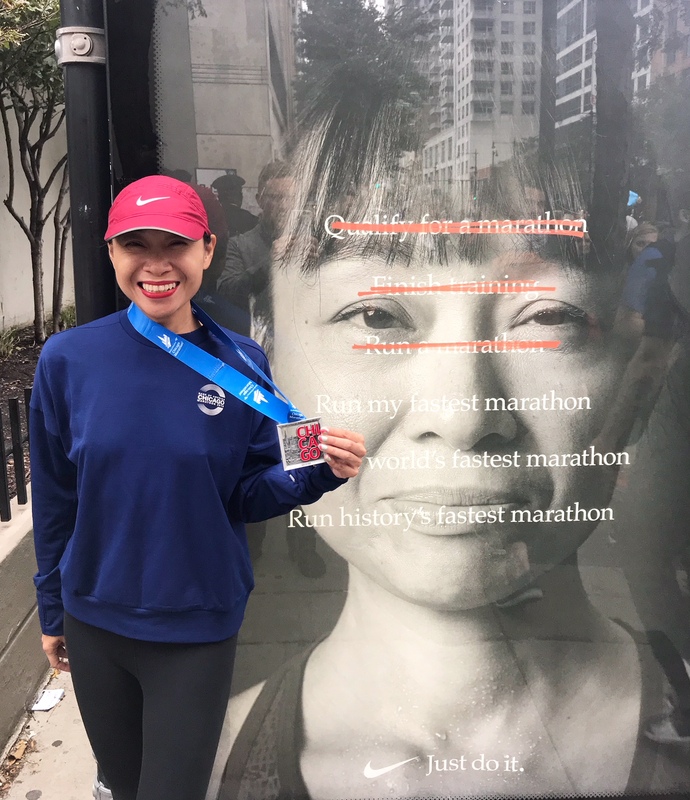 But this experience and the notion that I’ve maybe helped someone think that they should try running themselves or that they should try training for a marathon or to run Chicago (do it! ), it’s renewed my passion for the sport. It’ll probably always be a love/hate relationship with running for me, but right now. it’s all love.